Highlights from this week's celebrity fashion in photos. Yes, that's a dog in my Friday Fashion Files. I not only expanded from the usual "celebrity mom" photos to include all celebrities this week, I've included a pet. But not just any pet, a celebrity pet! 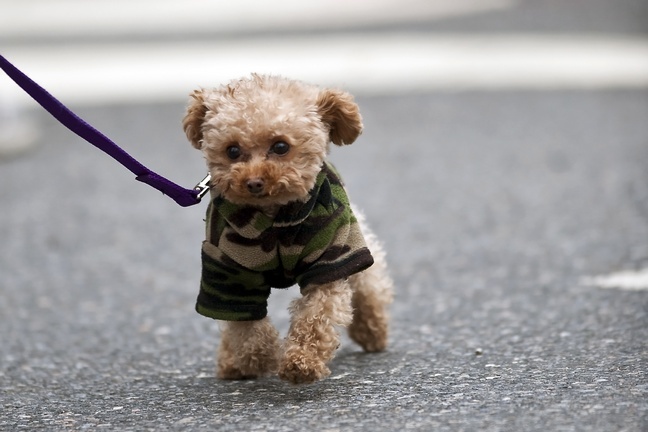 This is Blake Lively's precious maltipoo Penny in an adorable camouflage jacket on the set of "Gossip Girl" this week. Is she not the cutest thing you've seen all week? She looks like an Ewok! Heidi Klum was filming a commercial for AOL this week in Beverly Hills. I know this look is "in" for spring, but I have to admit that I'm not a big fan. If it makes someone as tall and slender as Heidi look like she's pregnant, imagine what it'll do for the rest of us "average" women? I'll pass. Jennifer Hudson shows off her incredibly-shrinking frame in this curve-hugging jacket with a white blouse underneath. You can grab a similar heart necklace here. It's okay if Jessica Alba's top makes her look pregnant, because she IS! She stepped out looking adorable yesterday as she headed to a meeting with Baby2Baby.org. Nicky Hilton is ready for summer! The socialite stepped out yesterday in shorts and a tank top, which says to me that California did not get the same 5" of snow that my corner of the world got this week! Her red Chanel bag is probably worth more than my entire summer wardrobe. Vogue magazine editor-in-chief Anna Wintour was spotted leaving her hotel in Paris yesterday. Anna is in France for Paris Fashion Week. I hate to be snarky and I may be struck down by lightning for asking, but why is the world's most famous fashionista always sporting the same haircut? Reese Witherspoon looked ready for spring in her casual jeans and tank top ensemble paired with a beige pair of Christian Louboutin heels.